The oldest Homo sapiens fossil found outside of Africa or the Levant suggests that early human migrations were far more frequent and geographically widespread than previously thought. North Africa and the Middle East are so geographically and culturally connected that the acronym MENA is often used to refer to the overall region for political, conservation, and other purposes. Just a 2.4-mile trip across the Suez Canal or its bridge can take travelers to and from the continents of Africa and Asia. Early human migrants did not enjoy such modern bridge and canal conveniences, but depending on the geological period and climate, travel between the two continents would have been quite possible over the millennia. This realization alone has put into question the original popular "Out of Africa" model, which suggested that humans were somehow all living in Africa before an adventurous group finally decided 60,000 years ago to migrate to the Levant — the eastern shore of the Mediterranean Sea. 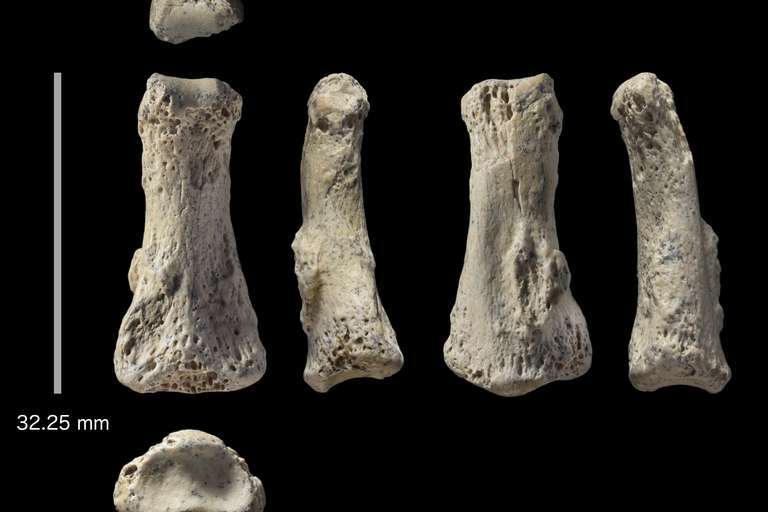 Putting that old theory further into question is the recent discovery in Saudi Arabia of an 85,000-90,000-year-old fossilized finger bone for our species. Reported in the journal Nature Ecology & Evolution, the intermediate phalanx (a middle bone in all digits except for the thumb) is the oldest directly dated fossil for our species outside Africa and the Levant. Huw Groucutt, lead author of the study, told Seeker that he and his international team enjoyed many "eureka" moments concerning the 1.3-inch-long fossil. First there was the excitement back in January 2016 when they first found the bone and knew immediately that it was from a Homo genus species of some sort. Back at their hotel, the scientists downloaded information on finger bones, and could see that their fossil did not resemble those for Neanderthals and other early hominids. Scanning the fossil in three dimensions allowed for a more detailed comparison with not only various hominids, but also non-human primates. The results confirmed the team's suspicions that the finger was indeed from an anatomically modern Homo sapiens. "We were very excited by each of these developments," said Groucutt, who is a postdoctoral fellow at the University of Oxford. 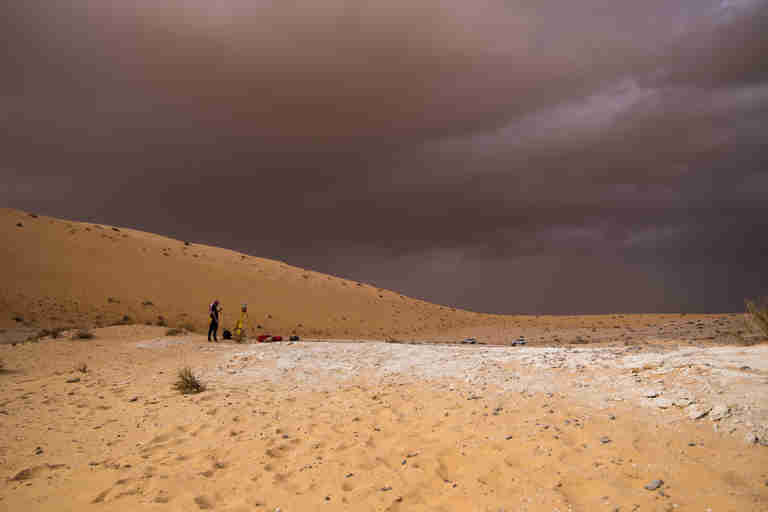 Groucutt explained that he and his colleagues "have spent the better part of a decade" looking for such a fossil in Southwest Asia. To determine the age of the finger fossil, co-author Rainer Grün of Griffith University and the Australian National University led a team that utilized a technique known as uranium series dating. The method involved using a laser to make microscopic holes in the bone and then measuring the ratio between tiny traces of radioactive elements. These ratios revealed that the fossil was 88,000 years old. Other dates obtained from associated remains and sediments converged to a date of approximately 90,000 years ago. During that time, the site where the fossil was found — Al Wusta in what is now the Nefud Desert — was home to one of several freshwater lakes. Analysis of sediments and diatoms, or microscopic organisms, show that the former lake system was perennial and therefore did not rapidly dry up and reform even as the seasons changed. "Most of the area was probably grassland, with some trees scattered around the lakes," Groucutt said. "The area would have been very seasonal, as rain would have come during the summer. So during the wet season it was probably a lush grassland, and then during the dry season the grasses probably died back. But then the fact that there were permanent lakes would have allowed humans and animals to survive all year round." He added, "There are hundreds of animal fossils at Al Wusta, and other sites in the region we have worked on, showing that there were vast herds of animals in the area." The animal fossils show a strong affinity to African fauna and include the remains of hippos, Pelorovis (an extinct genus of extinct African wild cattle), and African antelopes. "Humans may well have followed herds of animals, and-or both may have spread in parallel as they lived side by side," Groucutt said. The early migrants to Saudi Arabia were not lacking in tools possibly associated with hunting and working with animal skins. Groucutt, senior author Michael Petraglia of the Max Planck Institute for the Science of Human History, and their team found 380 stone tools made by humans at Al Wusta. "There are many ways of making stone tools," Groucutt said. "You can shape a piece of rock into a tool, such as a hand-axe, or a piece of rock can instead be used as a source of sharp flakes, which can be used for various tasks. The stone tools at Al Wusta belong to the latter, where small pebbles of rock were prepared in a particular way." The method that they used is known as the Levallois technique. The founding population perhaps arrived at the site with similar tools in tow. The migrants could have come from the Levant. Al Wusta is just 404 miles from coastal Israel, but the artifact assemblages from the two locations are not as similar as one would expect. If the migrants at the time originated in North Africa, they likely traveled across the Sinai Peninsula and either went north into the forested areas of the Levant or continued east and south into Arabia. It is also possible that migrants left or entered Africa near the southern end of the Red Sea over the narrow Bab el Mandeb strait, according to Donald Henry, a professor emeritus of anthropology from the University of Tulsa. Henry did not work on the new study, but is the author of an article commenting on the research. Henry told Seeker that "Arabia and much of the Levant are extensions of northeast Africa in biome, geology, and landscape" and that "the continental distinctions are simply geographic conveniences as opposed to reality." The finger fossil provides evidence for just one population that lived in this overall region around 90,000 years ago. Remains for Homo sapiens discovered at Misliya Cave in Israel date to at least 177,000 years ago, based on multiple, analytical methods that primarily looked at the age of a sliver of tooth enamel and burnt flint tools also representing a form of Levallois technology. The discoveries were reported earlier this year in the journal Science. The migration to Israel represents the earliest known dispersal of modern humans from Africa. There is also evidence for a second dispersal phase that took place as early as 65,000 years ago. Since the Al Wusta finds fall between these two phases, it is probable that early migrations from, and possibly to, Africa were more common than previously realized. Henry said, "I see no reason to suspect that there were one, two, and even a few population dispersals from Africa with the same cultural signatures, detailed physical confirmations and genetic compositions. More likely, in my mind, there was a nearly continuous flow of Homo sapiens groups out of Africa and perhaps even back again beginning as early as suggested by the Homo sapiens evidence from Morocco." That evidence, reported last year in the journal Nature, consists of fossils from the Moroccan cave Jebel Irhoud. The remains date to about 300,000 years ago and represent the oldest known fossils for our species. A skull found at a site called Florisbad in South Africa dates to approximately 260,000 years ago and is also believed to be early Homo sapiens. "I think the combined archaeological, fossil, and genetic evidence indicates that Homo sapiens originated across Africa," Groucutt said. "It is a model that Chris Stringer has called 'African multiregionalism.'" Stringer is an anthropologist at the Natural History Museum in London. Multiregionalism appears to extend beyond the African continent. "For now, at least,” Henry said, “it would appear that the bones, stones, and genes point to North Africa and the Levant as the most likely settings for the emergence of Homo sapiens." He added that an intriguing issue involves understanding the relationship of anatomically modern humans with Neanderthals. The recent fossil finds, including the newly discovered finger bone, suggest that these two hominid populations coexisted in certain areas for at least 20,000 years. Henry said that the evidence of Neanderthals tends to be found in the "wooded, rugged Mediterranean hill zone," whereas evidence of modern humans mostly is situated in lower land regions. He theorizes that "because of their short, lower limbs and robust stature, Neanderthals had less efficient locomotion and a higher, base-metabolic rate that acted to constrain their site exploitation territories." Their anatomy might therefore have restricted their ability to expand into other locations. It did not, however, stop them from mating with Homo sapiens. Because of interbreeding, people of European, Asian, and North African heritage today retain a small percentage of Neanderthal DNA. A greater puzzle is: What happened to the population represented by the Al Wusta finger fossil? "Many geneticists would say that they were a 'failed dispersal' who died out, but I think that is quite unclear," Groucutt said. "Genetic interpretations are evolving very fast. To really resolve these issues, several disciplines — such as archaeology, paleontology, genetics, and paleoenvironmental science — need to work together." 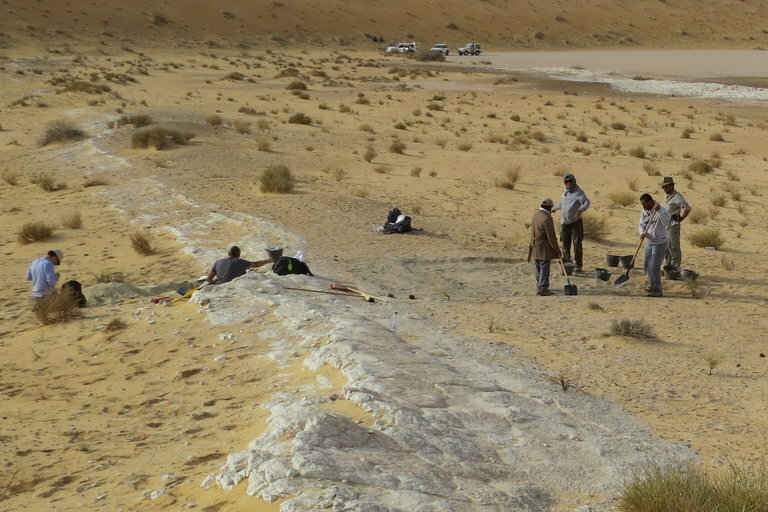 Groucutt and his team are continuing their research in Saudi Arabia, which involves close collaboration between not only the University of Oxford and the Max Planck Institute for the Science of Human History, but also the Saudi Commission for Tourism and National Heritage, the Saudi Geological Survey, and numerous colleagues from across the globe. "We are also looking at many different time periods," Groucutt said. "We have evidence that humans repeatedly spread into Arabia during periods of improved climate, going back hundreds of thousands of years, so we are currently conducting various studies on this."